1 Place water in a medium saucepan, bring to the boil. Add Knorr Vegetable Stock Pot and stir until stock has melted. Reduce heat to low. 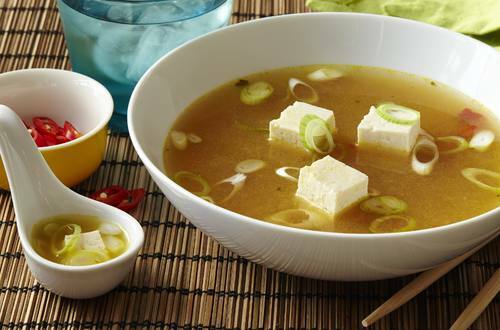 2 In a small bowl, combine the miso paste and add one ladle of the hot stock. Whisk until smooth and there are no lumps. Pour the miso liquid into the pan with the remaining stock and turn the heat to medium. Add the mirin, soy sauce and tofu to the pan and simmer gently for 4-5 minutes (do not boil). 3 Serve in individual bowls topped with the sliced spring onion. 4 Add some sliced red chillies if desired.